Buy online or in our store, it doesn't matter. If you live within our 30 mile radius delivery zone, Buckeye Furniture Store's team of professionals will gladly pre-assemble, deliver and setup your new furniture. 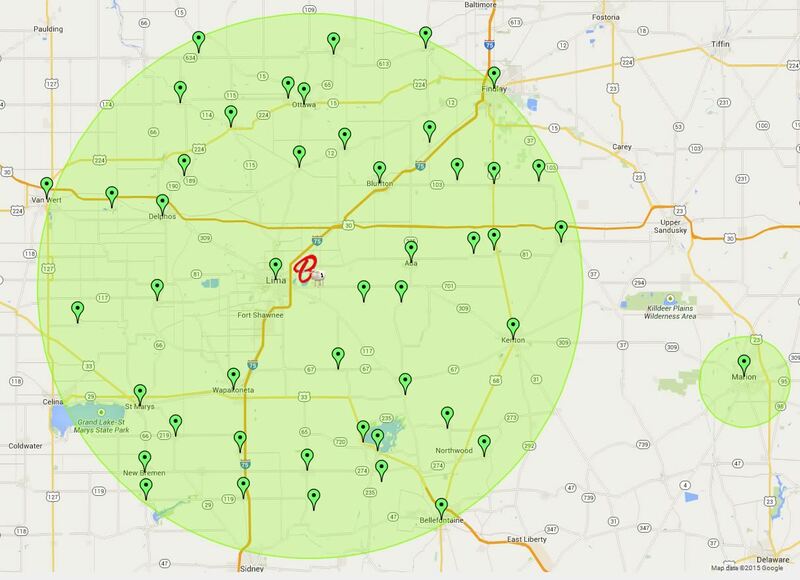 If you live outside of our delivery zone please call 419-225-9712 for a price quote. Our delivery service is a “white glove”. two person service that includes: inside placement to room of choice, stair carries (up to 2 flights), unpacking, setup, and removal of packaging debris. Standard delivery service is Monday – Saturday 9:00am – 6:00pm (based on scheduling and delivery zone). NO delivery on Sunday, New Year’s Day, Good Friday, Memorial Day, Independence Day, Labor Day, Thanksgiving Day, and Christmas Day. The delivery agent will attempt to deliver within a (3) three hour window and within (10) ten business days of receipt of product. 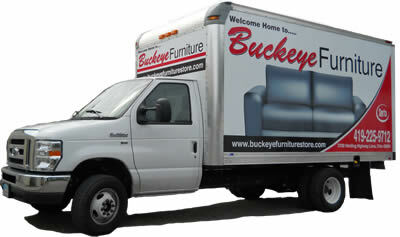 Buckeye Furniture makes every effort to deliver in-stock furniture to you within a (7- 10) seven to ten business day time frame. Ada, Alger, Anna, Arlington, Belle Center, Botkins, Cloverdale, Continental, Bellefontaine, Bluffton, Columbus Grove, Delphos, Dola, Dunkirk, Findlay, Forest, Fort Jennings, Glandorf, Harrod, Iberia, Jackson Center, Jenera, Kalida, Kenton, Lakeview, Leipsic, Lewistown, Lima, Maplewood, Marengo, Marion, Mendon, Middle Point, Minster, McComb, Mt. Blanchard, New Bremen, New Knoxville, Northwood, Ottawa, Pandora, Rawson, Roundhead, Rushylvania, Russells Point, St. Marys, Spencerville, Van Wert, Wapakoneta, Waynesfield. If you live outside our standard delivery zone, you are welcome to pick up your purchase at our store or call (419) 225-9712 for special pricing on deliveries outside our normal delivery zone. Depending on the size, mattresses are big and awkward. They typically don't travel well on your car's roof. If you choose this option, make sure you have the proper vehicle and tie downs to safely transport your new purchase. We will do all we can to help you secure the mattress to your vehicle. Just keep in mind that we are not responsible once you leave our store. Please feel free to give us a call if you have any questions regarding pick up sizes, weights, and recommended vehicle size. All accessory items including bed frames, sheets, blankets, pillows, mattress protectors and pet beds will be shipped via ground service if purchased separately from a mattress order. If purchased with a mattress set these accessory items will be delivered with your mattress order. Buckeye Mattress Center ships most in-stock orders to the U.S. within two business days of receipt. Standard shipping rates apply. Please allow 5-10 days for delivery of merchandise (Monday through Friday, not including holidays). Standard shipping is available for the Continental U.S., P.O. Boxes, APO and FPO addresses only. Please note: Delivery to APO and FPO addresses may take 4-6 weeks. Standard shipping is included for accessory orders with a value of $100 or more. A $9.95 shipping charge will be assessed for accessory orders less than $100 in value. You will always have an opportunity to see the full amount of your purchase with shipping charges before you confirm your order. Out-of-stock items usually ship within 10 business days. Accessory orders with items on back order may be held until they can be shipped complete. If you purchase your furniture through our online store you can expect delivery between 10 and 14 business days from the date of your order confirmation. This estimate is based on our experience and it could be more or less. You will receive a call from our delivery department to make delivery arrangements within 48 hours of your order confirmation. If you have any further question on your order status, you can call us at 419-225-9712.